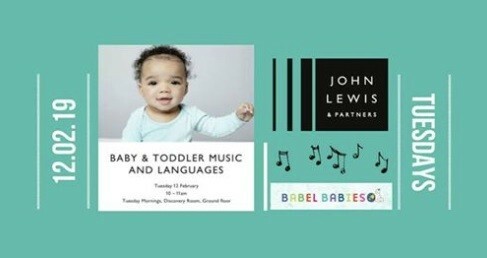 We are excited to be working with John Lewis and Partners, Cheltenham, to bring you a weekly music and languages session in the Discovery Room on Tuesdays 10-11am, with songs and stories, followed by some gentle craft for the children and coffee and chat for the grown-ups. All for £7! Book directly with the concierge desk in store. Starts 12th February, then 26th February onwards after half term. Places are limited and booking is now open!